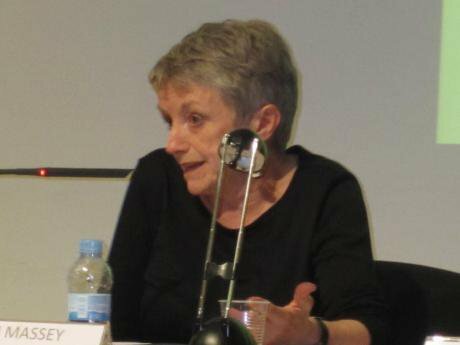 Doreen Massey (1944-2016): was a feminist, socialist geographer who shaped our understanding of space, gender and cities and who refused to abandon political activism. We got to know Doreen Massey, who died on Friday, during many years of working with and writing for Soundings, the journal which she founded with Mike Rustin and Stuart Hall. During that time she became to us not just a respected senior colleague and a close ally, but a friend. Our political instincts and sympathies often seemed more closely aligned with hers than with those of any other such senior figure that we knew – perhaps a result of the fact that, like, us, she had grown up in the North of England, outside of that culturally privileged zone – the North of London – in which eventually she made her home. Doreen’s pioneering works as a geographer (she sometimes rejected the term ‘cultural geographer’ as too restrictive) was informed by a concern with understanding power relationships in all of their complexity, and by a set of political commitments which put that work into allegiance with radical movements for democracy, equality and freedom, in many different spheres and on many different scales. As such, she was forever alert to and interested in the potential which new movements as well as new intellectual innovations might have, although she had no time either for dogma or for modishness. Indeed, it’s difficult to think of a British scholar of her stature who remained so consistently and directly engaged in immediate political activities alongside rigorous academic work. She could relate a unique history of having engaged with and advised such earlier key figures of the left as Ken Livingstone in the 1980s and Tony Benn in the 1970s. In recent years she was proud to have been invited to advise Hugo Chavez’ government in Venezuela, and to have had one of her key conceptual phrases ‘geometries of power’ directly cited by Chavez in his political speeches. But she was by no means a mere counsellor to Great Men of the Left. She was a lifelong feminist and was absolutely at the forefront of the radicalisation of human geography from the 1970s onwards: a pioneer both in developing approaches informed by Marxism and then in complicating those approaches with a detailed attention to the multi-dimensional nature of power, space and selfhood. In works such as Space, Place and Gender, For Space, and World City she established and cemented her reputation as an author read and appreciated way beyond the normal disciplinary boundaries of her field as well as a giant within it. Doreen had physical challenges all her life, yet she had enormous reserves of energy, attending meetings, talks, and activist events all over the place. Her work is renowned for its combination of complexity and lucidity, for highlighting multiplicities of power and the ‘throwntogetherness’ of space; of conceiving of place not as static or flat but ‘a pincushion of a million stories’. Her fierce, kind and creative commitment to struggle for societies and for a planet in which we share resources more equally was just as inventive and capacious in its geography. She showed that there are many spaces to intervene against those who don’t want to share the wealth: whether working with international, national or local governments, at universities, through writing, by taking part in grassroots activism or by ringing into Radio 5 Live. She was as keen on encouraging the everyday intervention just as much as the major project. She lacked any pretension, and her warmth, sincerity and generosity were widely appreciated. Her friendship also meant a great deal to us. She was one of the very first people we told, when out for a meal, about having a child. In fact she guessed Jo was pregnant even before we told her, and congratulated us, even though, as she said sarcastically, this would probably mean we’d do less political work (but she seemed reassured by our protestations that concern for our children’s future would only make us more determined). As a role model she was second-to-none, because Doreen seemed to understand better than anyone else what it meant to try to make scholarly work both conceptually sophisticated and always politically relevant, a feat she achieved as much anything simply by doing politics at the same time as scholarly work, rather than trying to fool oneself that one can ever serve as a displaced substitute for the other. Rather like her good friend Chantal Mouffe, Doreen was an inspiration to us in our early careers as much as anything for her simple willingness just to show up – at any meeting, seminar, or event, for any audience, whether she was a ‘keynote speaker’ or not, to help where she could, to find out what was happening, to lend her support and her wisdom. This sounds simple, even banal, but it wasn’t. We were part of the post-modern, ‘generation X’ cohort of academics in the humanities and social science amongst whom it became fashionable in the 1990s to find sophisticated theoretical excuses for complete political disengagement. Under such circumstances, nothing was more needed, at times, than the example of sophisticated senior theorists taking the time and the trouble simply to do some politics. Doreen was a great exemplar of this principle. Doreen was excited by the potential of Jeremy Corbyn being elected leader; finally a revolt in the mainstream Labour party against the reign of bland, destructive neoliberal technocrats. Not that she was under any illusions of the difficulties this would involve, in terms of the Parliamentary Labour Party, wider political persuasion or an aggressively hostile media. But it offered hope, and she was committed at looking, at zooming in, realistically and critically, at spaces for hope. For the same reason she connected in recent years with people involved with Podemos and Syriza, as well as continuing to work closely with a wide range of organisations including the environmental and social justice group Platform. Her creative approach extended to a collaboration with filmmaker Patrick Keiller for the film Robinson in Ruins (2010). Doreen loved the city which she made her home, and hated what it had become in recent years. Her book World City is a definitive account of how London came to be one of the centres of global financialisation, and the deleterious effects which this role has had on the city and its inhabitants. She had been actively involved and engaged with the radical Greater London Council of the early 80s and was interested in and hopeful about any possible moves to revive London’s radical culture and to find ways to taking it back from the super-rich. So Doreen was immensely interested in and sympathetic to new projects such as Take Back the City and the Compass ‘Good London’ project, and her work remains required reading for anybody wishing to engage seriously in such a politics. That work, and her exemplary life, will continue to be an invaluable resource in the struggle to make London a liveable city, and an asset rather than a burden for other parts of the world. Both inside and way beyond the M25, the sparkling lucidity of her ideas, the sheer reach of her politics and the grounded, democratic nature of her example will continue to energise, educate and inspire.